I was born at 05/03/1987 in Kemerovo, in 2004, graduated from PMS SESC NSU (Novosibirsk). In 2004 entered the Moscow State University Faculty of Soil Science, in 2009, I’v got a degree as a soil scientist. From 2007 he worked in the laboratory of proteomic analysis of Scientific-Research Institute of Physical-Chemical Medicine, Moscow, Russia. Performed a study of the proteome of bacteria Acholeplasma laidlawii under the various conditions and the impact of this microorganism in the microbial community gray-forest soils of the Moscow region. 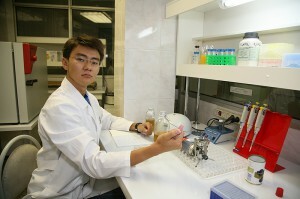 In 2009 entered graduate school Scientific-Research Institute of Physical Chemical Medicine, Moscow, Russia. Since September 2010, work in the Laboratory of Molecular Genetics of Microorganisms junior researcher. Prepared theses "Research the molecular mechanisms of resistance of Neisseria gonorrhoeae to the extended-spectrum cephalosporins». Investigation of the mechanism of resistance in pathogenic microorganisms at the genetic and transcriptional level. Study of mobile genetic elements ( including phages, plasmids) and the role of their transfer within the population and the microbial community. Sequencing and assembly of the Neisseria gonorrhoeae genomes. Research in Comparative and Functional Genomics. Analysis of the impact of stressful factors in the metabolic profiles of bacteria. Analysis of soil microbial communities, including metagenomic studies. Elena N Ilina, Maya V Malakhova, Ivan N Bodoev, Nina Y Oparina, Alla V Filimonova, Vadim M Govorun. Mutation in ribosomal protein S5 leads to spectinomycin resistance in Neisseria gonorrhoeae. Frontiers in microbiology. 01/2013; 4:186. 1. Genome sequencing of Neisseria gonorrhoeae strains with an average level of resistance to extended-spectrum cephalosporins. 2. Various Types of Genome Assembly after Pyrosequencing of Neisseria gonorrhoeae Strains. I. Bodoev, I. Altukhov, E. Ilina, I. Artamonova, A. Ibragimova, V. Govorun. 5th European Conference on Prokaryotic and Fungal Genomics, 18-21 September, 2011, Germany.